The Impulse is a guided wave radar (TDR) for total level and volumetric measurements on all liquids and slurries. When other water sensors quit the Impulse still delivers reliable measurements. The Drexelbrook Impulse is a two wire guided wave radar that employs field proven TDR level (Time Domain Reflectometry) technology to provide accurate measurement of Total Level, Distance or Volumetric outputs on all liquids and slurries. The Impulse is designed to tame even the most difficult level measurement applications and will continue to provide reliable and accurate measurements despite disturbances such as agitated, or irregular surfaces, foam or coating of the probe. It is unaffected by changes in density and dielectric properties, dusts, vapor, and turbulence. The Impulse simply keeps on measuring under conditions where other water level sensors quit. 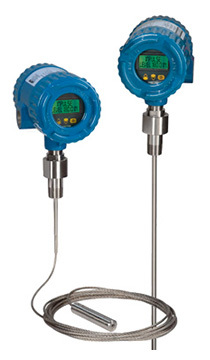 Offering a wide range of probe types and material selections for all applications this water level sensor is an ideal replacement for costly mechanical dispenser systems. Due to its easy navigation, push-button configurations and HART communications this guided wave radar is easy to use for any type of user. Installation takes only a few minutes. Simply select your level measurement type and your language and the Impulse is good to go. The Impulse guided wave radar is intrinsically safe, explosion proof and non-incendive. The Impulse requires no calibration or level changes. Request more information to see how we can help you with a guided wave radar that suits your need. Inventory control level measurement on raw feed silos allow material management automation. Avoid inaccurate results and high maintenance. Drexelbrook offers a cost effective alternative to displacer level measurements for refinery and petrochemical applications. Drexelbrook RF systems will accurately, reliably and repeatedly make DI Water measurements without “drift” by the correct selection of 3A approved Teflon covered sanitary sensors and electronic module selection. Drexelbrook offers a total level measurement solution for fly ash in silos.